Samsill Sterling Zipper Pad Holder/Ring Binder - 8.50" x 11"
Sterling Zipper Binder offers softly padded vinyl with the look and feel of napa leather. Offers sleek radius corners. 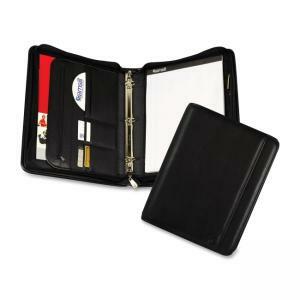 Wraparound zipper to provide security for important documents. Two full-length exterior storage pockets, interior expandable document pocket, zipper security compartment, business card and CD pockets, pen loop, 1" metal rings for loose-leaf pages and writing pad.